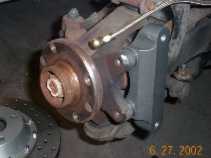 Note....the following pictures and captions are how Dave Meyers upgraded his brakes on his 1991 Elan. This is not an endorsment of the products pictured, nor any is it any recommendation that you should do it this way. 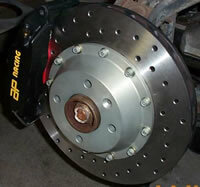 Modifying ANY components (especially brakes) of a car is something to be taken very seriously, and you should consult people far wiser than Dave or lotusowners.com for assistance in these matters. Use of this imformation is at your own risk. 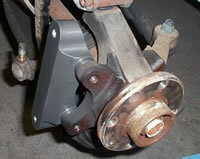 AP Caliper bracket installed. 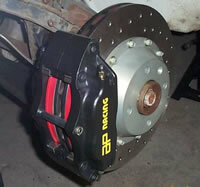 This utilizes the stock 10mm hex bolts that hold the stock caliper. 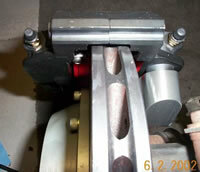 The center bolt and sleeve shown on top of thecaliper comes out quickly for very simple pad changes. A top-down shot of the setup. The monster lurking in the shadows. A few notes on the kit: The rotors, even with the aluminum hats seem a bit heavier than stock (not surprising due to size), however the caliper is much lighter than the OEM unit. Overall weight I would guess is the same. 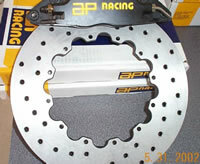 Pad size is just slightly larger than stock, though the extra swept area of the rotor should alleviate most heat issues. 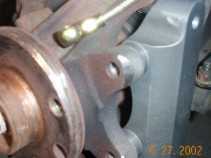 The caliper also uses the stock brake lines. 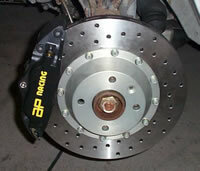 Pad changes are a two-minute job once the wheel is off. You merely remove the top pin in the caliper, slide the old pads, slide the new in, replace the pin and wheel, and you're done. Perfect for me as I plan on swapping race pads in for track days. 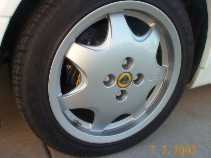 without serious effort, so I find my braking distance is now limited by my tire choice.